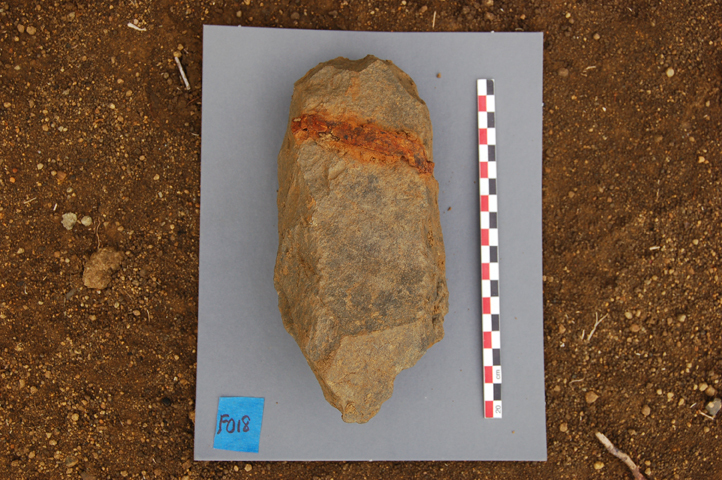 This report is the third in a series documenting the implementation of permitted excavations in Rano Raraku quarry on target statues RR-001-156 and RR-001-157 . 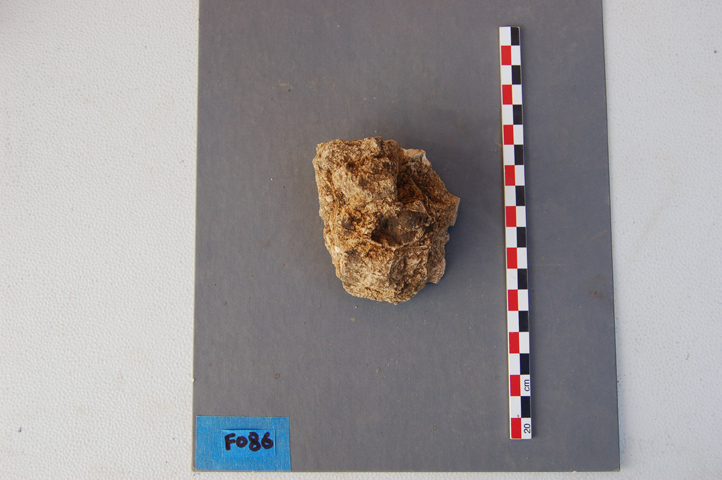 Specifically, this report deals with the third excavation season, or Phase 3, and is focused specifically on RR-001-156. The conservation follow-up work that is anticipated for March, 2011 will be conducted by Dr. Christian Fischer and documented by him in a separate report. The target statue for this season is RR-001-156. 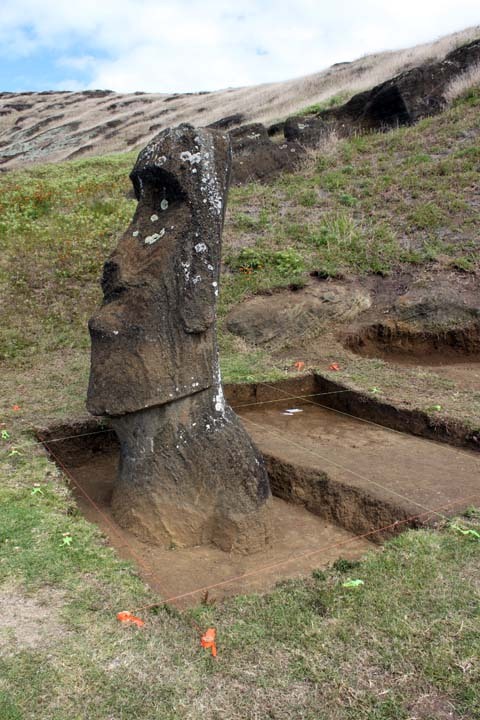 It was previously excavated by the Mana Expedition to Easter Island in 1914-15 (Routledge 1919). According to Routledge’s unpublished notes, “at the start, the statue was buried to a line midway between the lobe of the ear and the angle of the jaw” (NGS/WKR). Two separate excavations, both of which were haphazard and are poorly documented, were made of the dorsal side of the statue. The first excavation reached “to a depth of 16 feet measuring from the crown of the head.” The second excavation at the back was made “to extend the first excavation to 10 feet from the statue back” simply to take photographs. At the front, excavation reached “to the navel.” Our Historic Level Book provides a synopsis of the excavations and the objects collected. 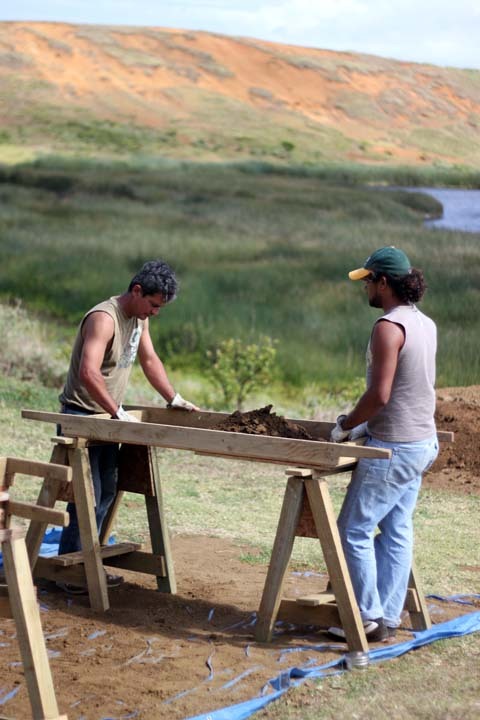 This report is a preliminary statement of the tasks undertaken and goals achieved during the second field season of Phase 2 of the Easter Island Statue Project Conservation Initiative. Phase 1 took place in April, 2010 and a full report of that work is on file with the appropriate agencies. This report is a detailed overview but not a final, scientific analysis or synthesis of our findings. 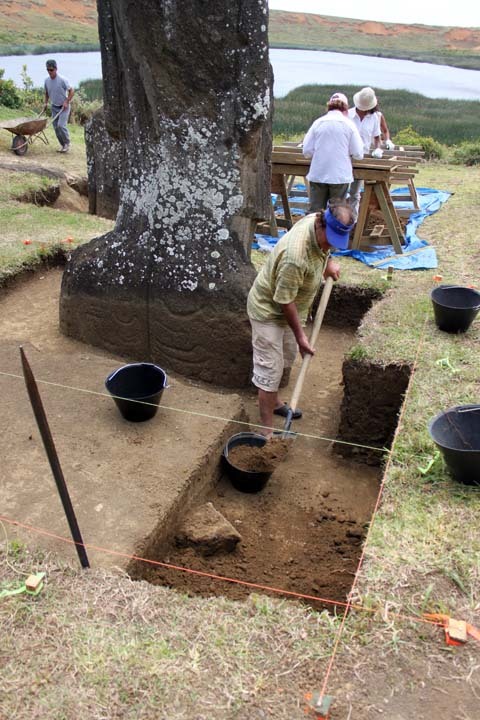 That will be produced at the end of the combined work planned for Phase 3 and Phase 4, which entails the similar excavation and study of Moai RR-001-156. The Conservation Initiative is funded by the Archaeological Institute of America, and its intent is a scientific evaluation of the state of preservation, above and below ground, of the two statues described here (RR-001-156 and RR-001-157). In addition, the Conservation Initiative will monitor and collect scientific data on the discrete environmental contexts of the two statues. These data will be employed to determine the course of stone stabilization treatment to be embarked upon for each statue, and how that treatment may or may not be generalized to other statues. 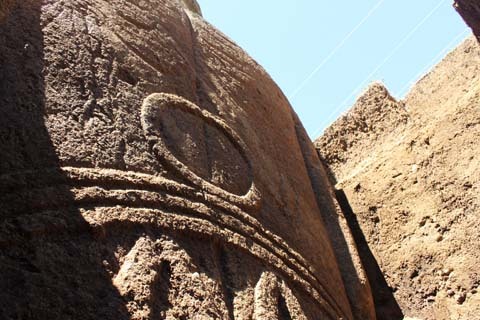 Through a methodical archaeological survey we have accomplished the digital mapping of Rano Raraku statue quarry, documented over one thousand statues throughout the entire island and created the world’s largest archaeological archive describing the statues. Working with scientific colleagues at The Cotsen Institute of Archaeology at UCLA and with conservators from Chile’s Centro Nacional de Conservación y Restauración. 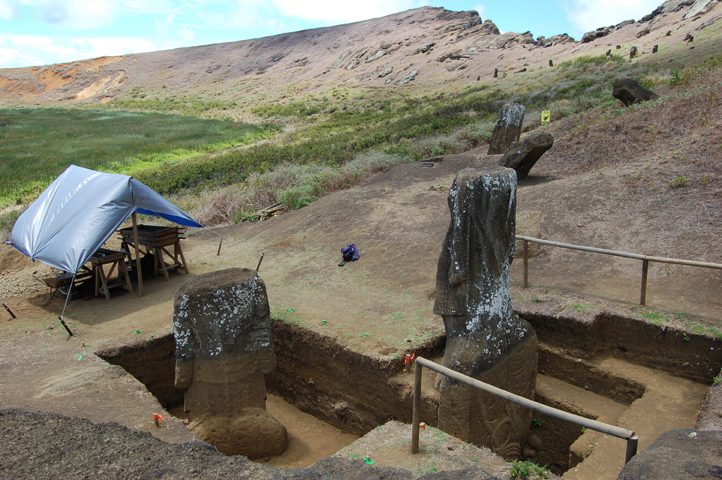 We are excavating and conserving statues in Rano Raraku interior quarry. 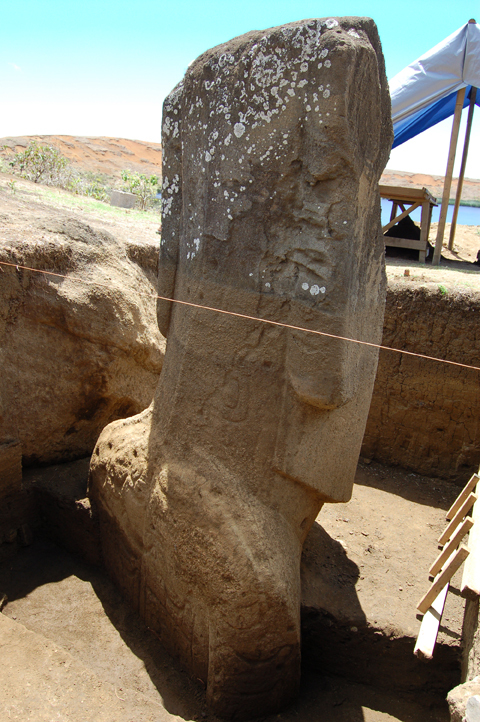 Knowledge gained there will allow preservation of other statues throughout the island. 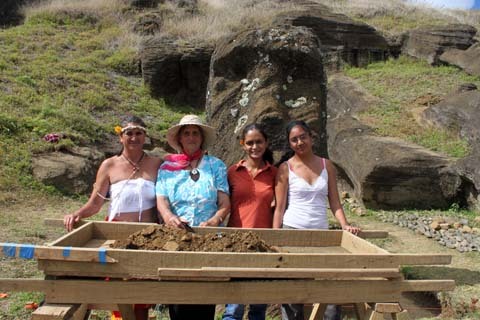 In 2008, our work was rewarded with a grant from the Site Preservation Task Force of the Archaeological Institute of America (AIA; www.archaeological.org). A wonderful AIA grant jumpstarted our conservation initiative. EISP has no endowment. Our only source of income is grants and U.S. tax deductible contributions. Please join us in A Monumental Task, become a Friend of EISP! 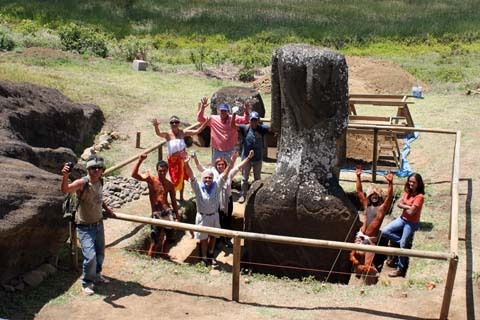 Dr. Christian Fischer and Ms. Monica Bahamondez P.
The main objectives of this mission, carried out with the assistance of Cristián Arévalo Pakarati, Rafael Paoa Rapu and Vaiheri Tuki Haoa, were firstly, to apply the protective treatment on statues RR-001-157 and RR-001-156 currently being excavated by EISP and secondly, to start the Toki Sourcing Project by analyzing the elemental composition of the ‘toki’ found during the excavation using a portable X-ray fluorescence spectrometer. Illustrated paper delivered in Session 3c: Workshop “Pursuing Best Practices in Site Preservation.” Moderator: Alexandra Cleworth. 111th Annual Meeting, Archaeological Institute of America, Anaheim, CA, 9 January 2010. Abstracts Volume 33. 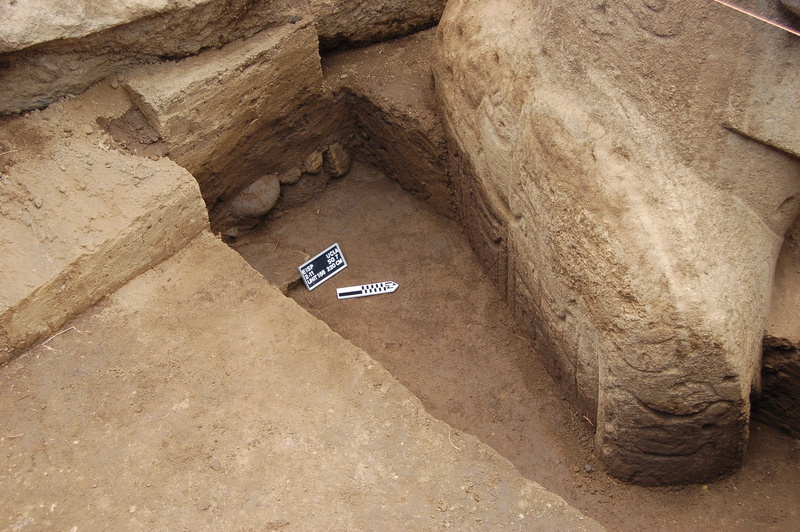 Boston University: Archaeological Institute of America, 55. 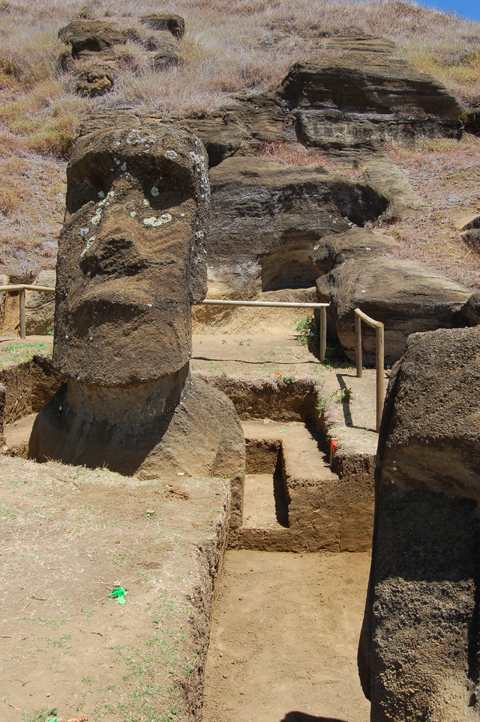 The monumental stone statues of Easter Island (Rapa Nui), Chile are world-famous icons of artistic imagination and engineering ingenuity. Their fragility, coupled with the fact that Easter Island is a major tourist destination, creates an urgent conservation imperative. 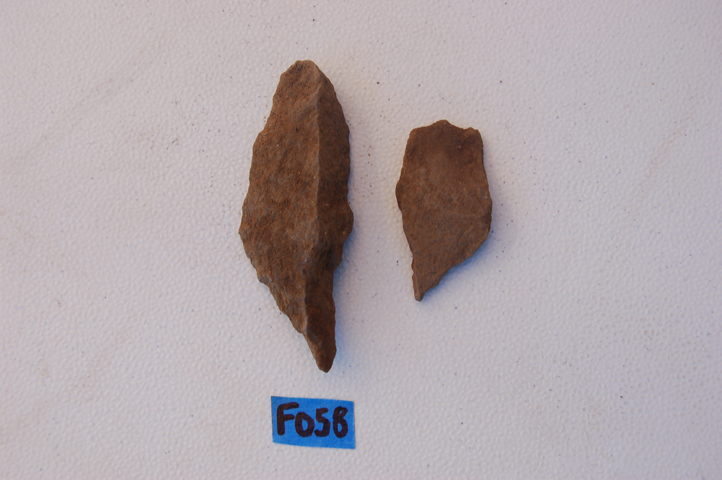 Our modern archaeological inventory preserves them and their individual histories, facilitates the articulation of cultural identity, and supports shared stewardship and sustainability in a tourist-based economy. 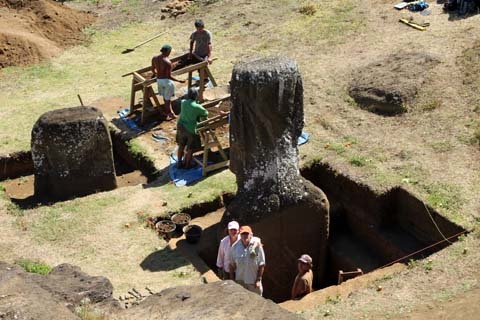 Boston – The Archaeological Institute of America (AIA), North America’s oldest and largest organization devoted to the world of archaeology, has selected the monolithic sculptures (moai) of Easter Island (Rapa Nui), Chile, and national park as its second site preservation project. 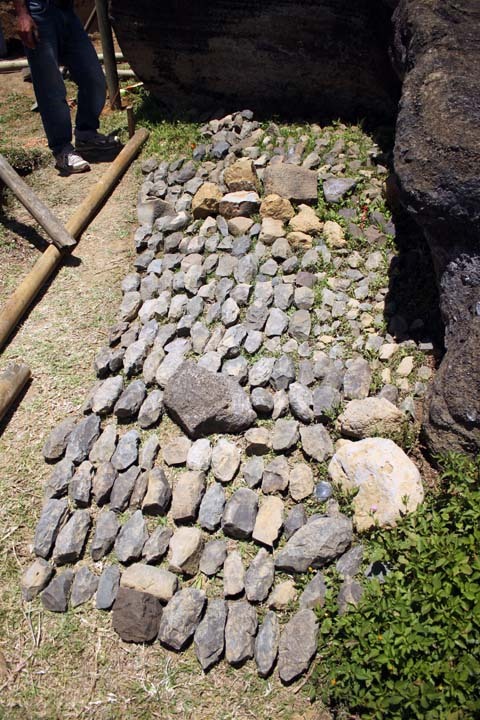 With a grant to the Easter Island Statue Project from the organization’s AIA Site Preservation Task Force, the Project will develop stone preservation techniques to arrest the rapid deterioration of these statues as a result of the fragile nature of their volcanic stone, climate change, and tourism. 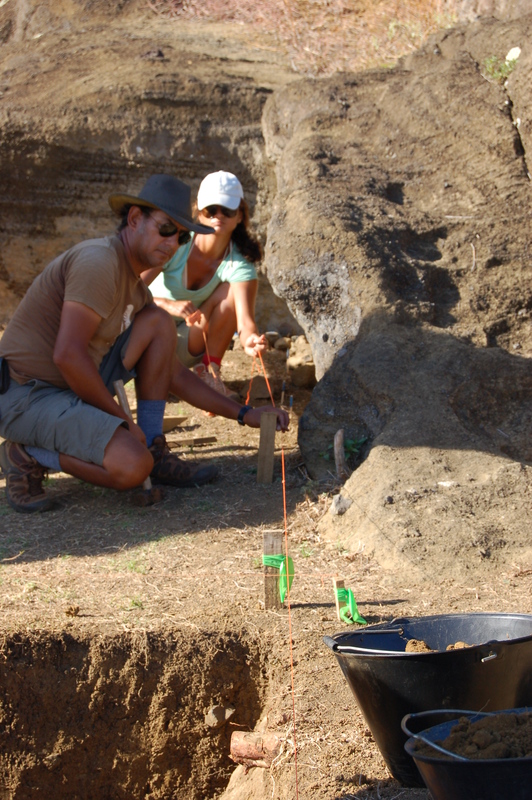 The Easter Island Statue Project is directed by UCLA archaeologist Jo Anne Van Tilburg and co-directed by Cristían Arévalo Pakarati. 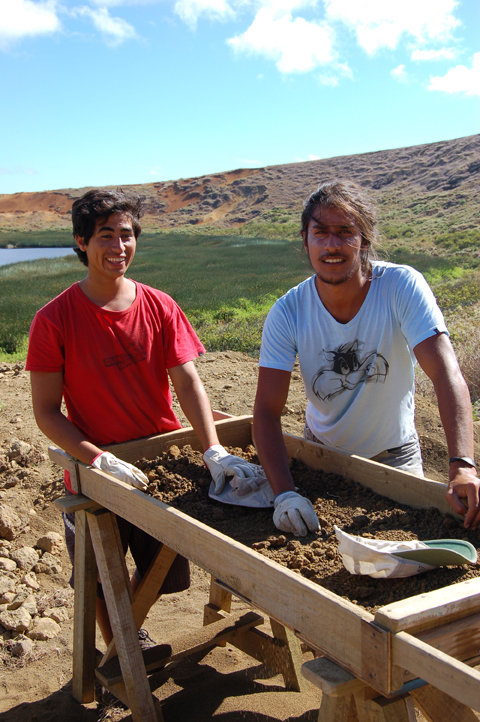 Meet our EISP Excavation Crew!